Is Homemade Laundry Detergent Safe for HE Washers? You have just made your first batch of homemade laundry detergent. While the liquid or powdered detergent was simple to make and will save money for your family, you now have a huge amount on hand. Every recipe for homemade laundry detergent is safe to use in a standard top load washer that uses plenty of water for the wash and rinse cycle. Are homemade detergents and other homemade laundry products safe to use in front load or top load HE or high-efficiency washers? 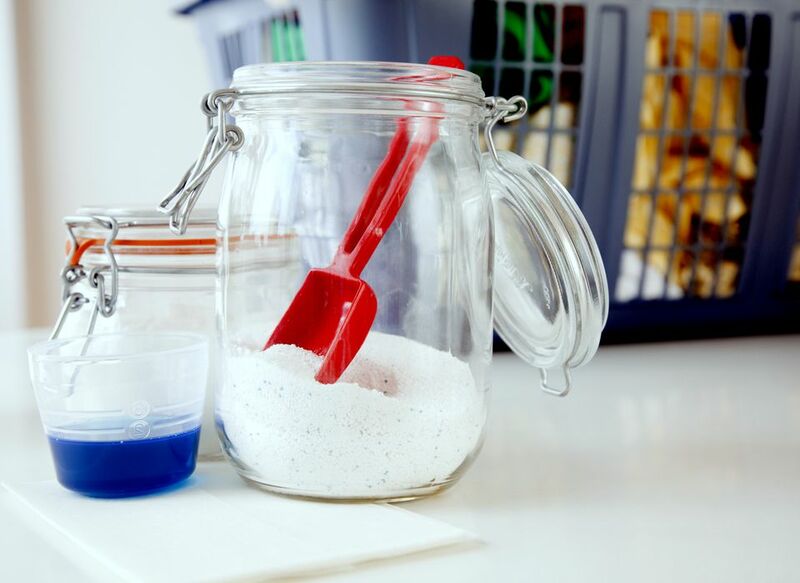 Homemade laundry detergent can be made as a liquid, powder or single dose tablet. Since none of the recipes or formulas contain a sudsing agent as an ingredient, they are all safe to use in a high-efficiency washer. Use two tablespoons of liquid or powdered homemade laundry detergent or one single dose tablet per load. Top loading HE washers work well with powdered, liquid or single dose tablets homemade detergent. Whichever format you have made, just add it directly to the washer drum before loading clothes. For front-loading machines that use less water, a liquid homemade detergent seems to work more smoothly especially in an automatic dispenser. If you are using the automatic dispenser on either type of high-efficiency washer, be sure that the homemade detergent has no clumps and is flowing well. Shaking the container may be sufficient, but if the liquid is not smooth, mix the detergent with two tablespoons of hot water before adding to the washer's automatic dispenser. If you choose to use powdered detergent in a front load washer, add the two tablespoons directly to the drum before loading in the soiled laundry. If you experience problems because the detergent doesn't dissolve completely and leaves white residue on your clothes, dissolve the suggested two tablespoons of homemade powder in one cup of very warm water before adding it to the drum. Never place homemade dry detergent powder in an automatic dispenser. It will not dissolve and dispense properly. Homemade single dose tablets-like their manufactured cousins-should be placed directly in the drum of the washer before loading in soiled clothes. Again, dissolve in warm water if you have problems with residue. If you are washing items like sweaters or lingerie on the gentle cycle and plan to use a homemade wool wash, it should also be dissolved in a cup of warm water before adding to the drum in a high-efficiency washer. The homemade wool wash formula forms a thickened gel and dissolving it in water before adding clothes will make sure that everything is well cleaned. As with the use of any detergent, clean the high-efficiency washer often to prevent odor and build-up of lint and residue. If you like to add scent to your laundry, homemade scent enhancers are very simple to make using Epsom salts and essential oils. These dry formulas can be added in the quantity you desire to achieve the level of fragrance you love. Simply add the dry formula to the bottom of the high-efficiency washer drum before you load in the soiled laundry and before water is added at the beginning of the cycle. If you talk to any manufacturer of high-efficiency washers, they will tell you that one of the worst enemies of the washer is commercial fabric softener. The softener if filled with ingredients that leave a coating inside the washer drum that acts as a breeding ground for mold and mildew especially in damp, warm spaces. If you feel the need to use fabric softener in your laundry routine, a homemade version that is made from distilled white vinegar, baking soda and essential oils for fragrance is a much friendlier choice for high-efficiency washers. The homemade fabric softener has a tendency to separate so it needs to have a good shake before every use. After shaking, it can be placed in the washer's automatic dispenser or in one of the fabric softener balls you can purchase that releases the fabric softener during the rinse cycle.